This song presented one problem. The German singer to whom it had originally been assigned was uncomfortable about having to sing the praises of a German soldier, a son of the Fatherland – ‘ein biedrer, deutscher Mann’. It is not difficult to imagine that such words seem easier to declaim without a sense of irony and discomfort for an Englishman – someone whose forebears have played no part in the traumatic events of German history in the last sixty years. As hard as it may be for us to imagine Germany as a plucky and violated little country, this is exactly how its reputation stood in English eyes in the wake of the Napoleonic Wars. (Indeed, this is how it continued to be regarded throughout the Victorian era, as well as being acknowledged as the home of culture, and unworldly artists and intellectuals.) 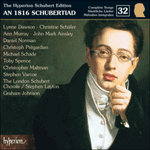 In 1816 there was every reason for Schubert to be patriotic. It was natural for him to be proud of the German and Austrian successes against the French (for the purposes of broader cultural identification the two German-speaking countries were one – Schubert would not have been surprised, nor would he have objected, to have heard himself referred to as a ‘German’ composer). Vienna had been an occupied city, and there were many casualties as a result of the war which had ravaged Europe; among these was Schubert’s acquaintance Theodor Körner, celebrated poet and soldier who had given the teenage composer some valuable words of encouragement. The sight of wounded and crippled soldiers in the streets of Vienna must have been a daily occurrence. By the middle of 1816 the after-shocks of war could still be felt and seen; former soldiers were still dying of the long-term effects of wounds and injuries untreatable by the medicine of the time. This may account for the fact that there seems something about this setting which suggests occasional music – as if it were composed in honour of a bereaved friend, or family, of the composer’s acquaintance. If a soldier had died in 1816, some time after his return from the front, such a page of music would have been a welcome and thoughtful mark of respect. The music stands at a distance, and the marking ‘Ernst’ (‘serious’) says it all. It does not suggest deep personal involvement, only a sad and dignified response to the death of someone who had done his duty. The point of the poem, surely, is that this is no national hero, only a typical German man and patriot. Of course it is also possible that Schubert came across Schubart’s poem and was moved to set it for no reason beyond an empathy with the text. But it is without question that the aftermath of the recent war had predisposed him to be sympathetic to these sentiments. If this is not a great song, it is full of genuinely Schubertian details, some of them thumbprints of the 1816 songs: the voice doubled by piano at ‘Zieh hin, du braver Krieger du!’ which signifies both solemn ceremonial and manly determination; the softening from G minor to a yielding G major at the phrase ending ‘Grabesruh’; the expressive jump of a fifth on ‘Wehmuth’; the elongated setting of ‘stumm’ sung first in an unaccompanied void, then joined by a muted diminished chord in the piano. The most personal and beautiful part of the song, however, is the seven-bar postlude where quavers fall in gently melancholic sequences – poignant and haunting music which seems to ponder the sadness of the human condition at the moment of valediction. The music works well for the subsequent strophes, particularly for the fourth, and last, verse performed here which ends with a promise of eternal bliss. There are eight verses of Schubart’s poem printed in the Gesamtausgabe. Du warst ein biedrer, deutscher Mann. Hast immerhin so brav’ gethan. Für Wasser und für’s liebe Brod. Schlossst deine Augen freudig zu. Jetzt kommt die ew’ge Seligkeit. walk silently before your coffin. You were an upright German. feared the bullet and the sword. for water and for bread. and struggle of Time is past.